This book investigates the parallels between mainstream development discourse and colonial discourse as theorized in the work of Homi Bhabha, Gayatri Spivak and Edward Said. Aiming to repoliticize post-colonial theory by applying its understandings to contemporary political discourses, author April Biccum critically examines the ways in which development in its current form has recently begun to be promoted among the metropolitan public. Biccum contends that what has begun is a sustained marketing campaign for development that is a repetition, augmentation and ultimately much greater success of the work of the Empire Marketing Board of 1926. 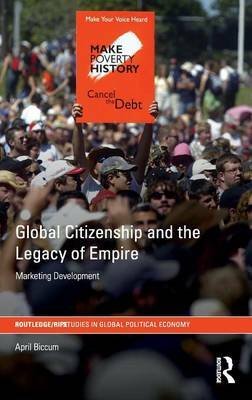 Demonstrating how this marketing campaign for development attempts to facilitate support for neo-liberal globalization, Biccum contends that this theatre of legitimation is emerging in response to growing critical voices and counter-hegemonic activity on the international stage. Featuring in depth analyses of the UK, cultural values, DfID, the commemoration of the slave trade and campaigns including Live8 and Make Poverty History, this book will be of interest to students and scholars of postcolonial studies, development studies, and international political economy. It will also offer insights valuable to a wider range of subjects including critical theory and globalization studies.